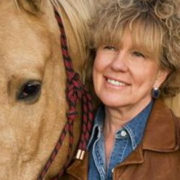 Joy Silha, “Inner Cowgirl” Coach, is a certified Martha Beck Life Coach, certified Equus coach, and a passionate animal-nature person! My purpose? To Awaken Your Inner Cowgirl! A cowgirl is a woman who gets in touch with her true nature: her freedom, passion and talent. She is bold and adventurous, but also compassionate and connected to nature. I have created “Awaken Your Inner Cowgirl,” a coaching practice focused on encouraging women to find their authentic voice. I’ve owned horses for over 20 years, and have learned powerful lessons from them. I use horses as a mirror in my “coaching with horses” specialty, offering a life-changing spiritual experience of self-discovery. I am a coaching columnist for the Albuquerque Journal and a writer for national publications. In a previous life, I was a marketing consultant to Ad Agencies and Fortune 500 companies.